Give Me My Remote > The Office > Angela Kinsey > Donate to THE OFFICE Crew & Win an OFFICE Experience!! Donate to THE OFFICE Crew & Win an OFFICE Experience!! On Saturday, November 10, the 102 members of THE OFFICE production crew were laid-off without severance. 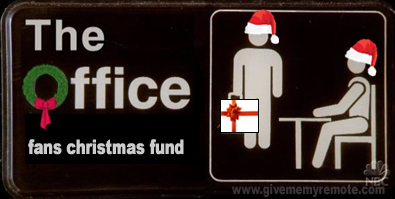 As the holiday season approaches, fans of THE OFFICE have united in an effort to show a gesture of appreciation by creating the Office Fans Christmas Fund. Founding members of this fund have teamed up with co-Executive Producer, Kent Zbornak, to ensure that the funds reach the intended recipients. Now in addition to donating, you have the chance to win a special day on the set of THE OFFICE. To participate in the auction, click here. – Guests must be 16 years or older. – Guests must provide their own transportation to the Studios in Los Angeles. – Guests must sign a non-disclosure statement. – Availability of the visit is subject to THE OFFICE production schedule (winner will be given a set of dates to choose for the visit when the show get back in production). Even if you don’t win the auction, you can still get a little piece of THE OFFICE: Everyone who donates will be sent a special surprise from Mr. Zbornak when production begins again. (1) Please visit the Fund at www.myspace.com/ofcf. (3) Then email officefanschristmasfund@gmail.com with your mailing address and holiday message to the crew. In your email, please include the name on the PayPal account you used, and if it should be changed for the card. oh my god this would be amazing. I will have to do this!!! YAY! No I just got my paycheck and it’s cancelled!? Madness. 🙁 This is really bumming me out.